Beloved and I had dinner a couple of nights ago at Domo. 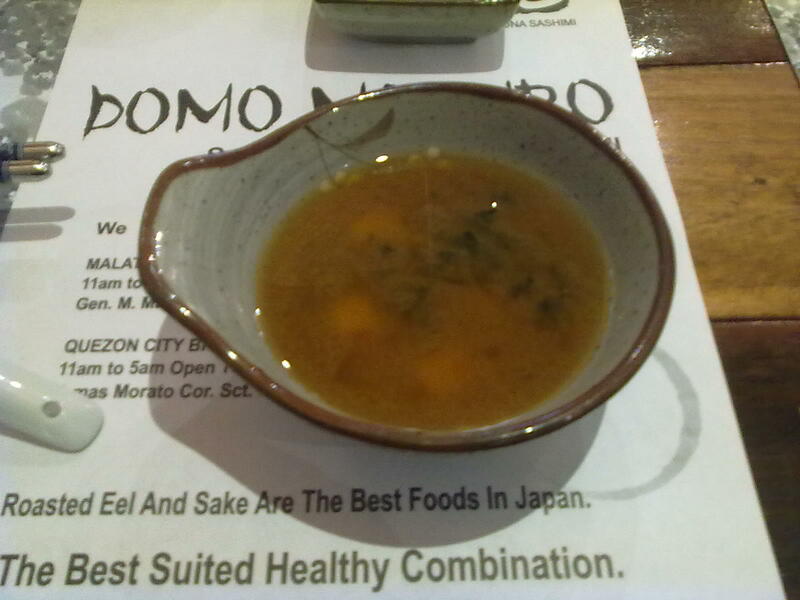 This somewhat newly-opened Japanese restaurant is located right below YakiMIX Tomas Morato. The main incitement it has on us is the fact that they boast “Unlimited Tuna” under the store’s signage. Although it wasn’t really enough to sway us, since we have a “safer” choice in the restaurant above it, for some reason we ended up there. It was a cozy restaurant, very Japanese in design. The sushi chef and perhaps the owner looked like they have Japanese blood themselves. 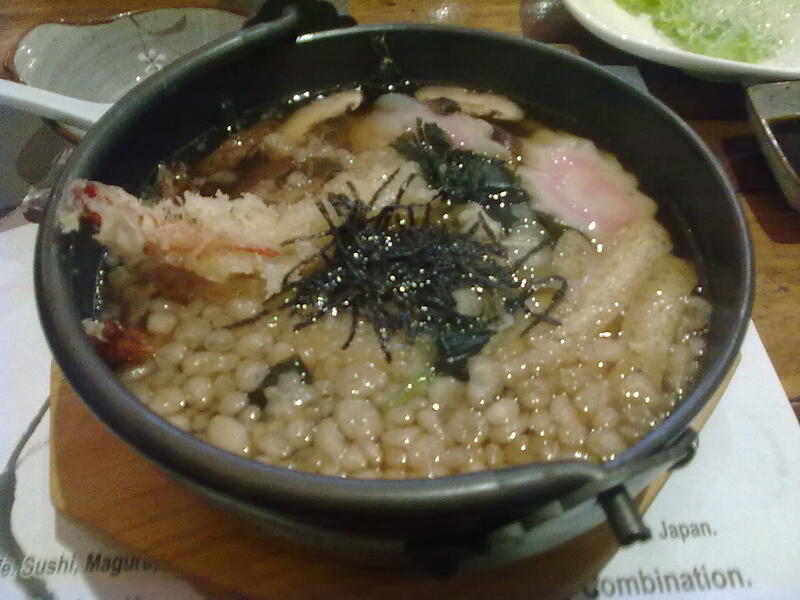 That fact aside, indeed, their menu has the usual Japanese food fare from any comparable Japanese restaurant. Sadly, their “unlimited tuna” choices were a bit out of reach for us—1000 Php for the cheapest per-head unlimited tuna sashimi order. However, it does boast a lot, and I do really mean a lot, of sides. Just to sample what’s in store for those who opt this special, we ordered for ourselves their Maguro Sashimi, or, for non-Nihongo understanding people, Tuna Sashimi (250 Php). Beloved had their Tempura Udon (220 Php), which looked really good in the menu picture. Finally, I had an order of their Chahan (180 Php) or Japanese Fried rice, and their Ebi Tempura (190 Php), or prawn tempura. I was quite pleased that they serve Miso Soup on the house. Admittedly, this is one of the better ones we’ve had, compared to the watered-down most of the competition serve. In addition to that, it’s also worth mentioning that their water has green tea in it, giving it a peculiarly refreshing aftertaste. Finally, I noticed that our server, throughout the service, has been the most courteous server in any restaurant we’ve been to, bowing humbly every time something is served or a plate is taken from us—more plus points from me. 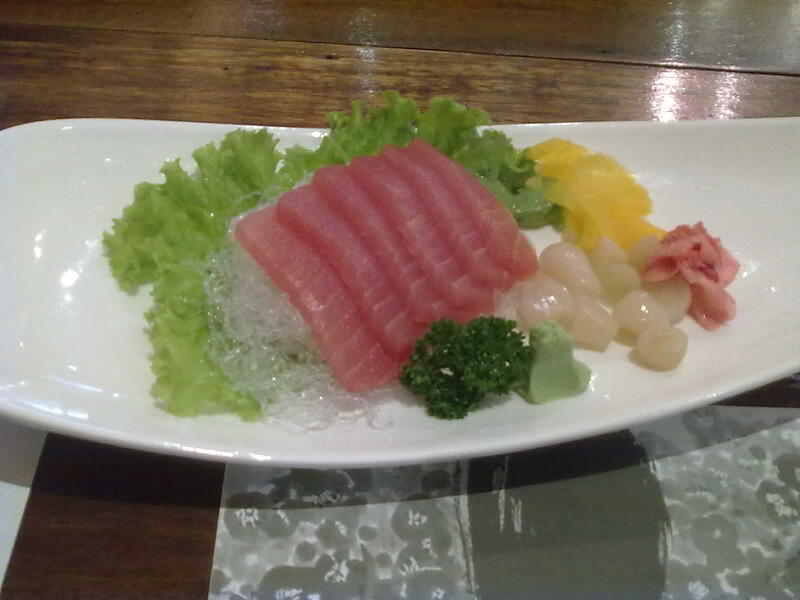 Presentation-wise, their Maguro Sashimi wins over most restaurants we’ve tried, except perhaps for Sakura at SBMA. They are served over cold bean noodles plus they have a side that I have no idea what is, but tastes pretty good. As for the tuna, taste-wise, this is also one of the fresher, superior ones we’ve had. There’s no frozen taste or gummy texture in these slices. The only fact that disappointed me in this plate was the quantity. Beloved was a bit disappointed that their Tempura Udon didn’t look like the one in their menu. Particularly, it didn’t have any fried egg, which she immediately tried finding upon receiving the bowl. However, she was quite pleased with the soup, stating this is the best one she had the privilege to try out. I was also a bit surprised by the fact that the noodles they used lack any sort of firmness. Instead, they almost melt in your mouth. 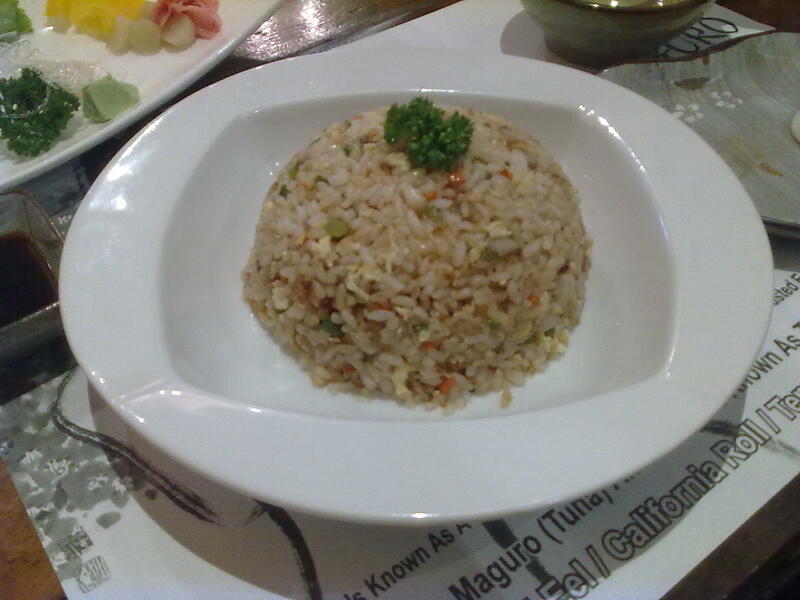 As for my Chahan, well, there’s enough for two. However I was expecting a serving good for three or four. I have no complaints with its heat and taste, though. 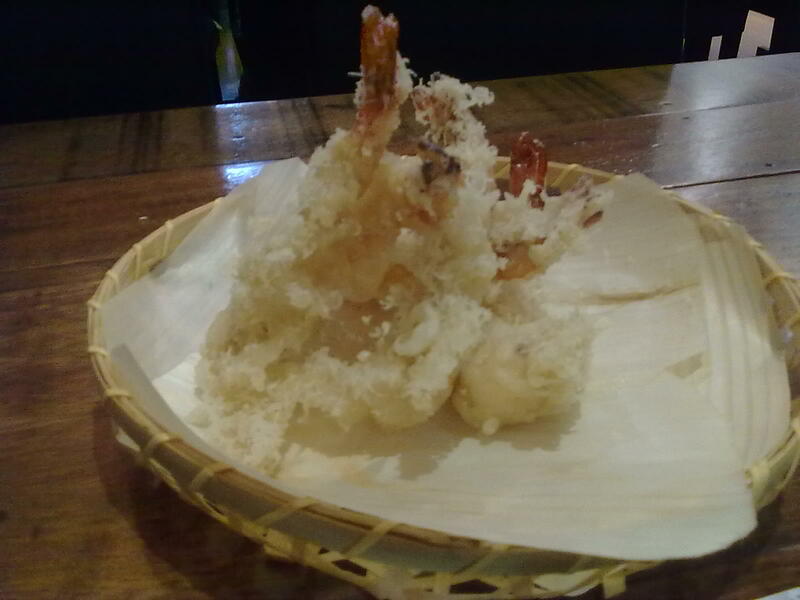 Finally, there’s the Ebi Tempura, which arrived in five pieces. Size-wise, they’re a bit below average. However, again, these prawns taste pretty good, both in meat and batter. Actually, the batter didn’t have any taste at all—it just provided for a crunchy bite for shrimpy goodness. Not bad at all. My last sentence for the last dish basically sums up Domo. Not bad at all. Except for the chahan, their choices are priced very competitively. Per piece, I believe they have the most affordable tempura in the street, and for how it tastes, it’s certainly a very good value. Beloved’s soup had a very generous serving and a very good taste. Their tuna sashimi is up there in quality. And, for fish that fresh, I’m willing to spend the 1000 Php needed to eat as much as I want of it. But that’s not all the unlimited tuna they offer—they also have more expensive choices having superior cuts (the belly) or additional side dishes. Anyway, to sum it all up, even though we didn’t get to try the unlimited tuna, the visit to Domo was worth it. Recommended for: Japanese food lovers, Tuna sashimi lovers. Smart nomnomnom tip: They serve miso soup on the house.